With the NFL’s second season upon us we have to look back to the team and players who made the 2018 season. Keep in mind this blog is about defense and the unheralded players appreciated by the rank and file. Yet bookending a season where Taylor Blitz & The Chancellor was there for the induction ceremony for our 1st subject written for the PFHoF in Robert Brazile, it’s with great pride to announce the 1st 2 time Taylor Blitz Times Defensive Player of the Year in Chicago Bear Khalil Mack. Mack made his presence felt the second he put on a Bears uniform. Mack bested ’17 Taylor Blitz DoY Aaron Donald for this honor based upon his ability to show up in important games and the domino affect he has had on a division and a conference. Dating back to a 2010 loss to the Green Bay Packers in the NFC Championship, the Bears were 2-12 against them while Aaron Rodgers and company won the NFC North 5 times. The Bears either finished 3rd or last in all 7 of those years. The Bears trade for Mack and sign him on Sept 2nd and one week later & not in football playing shape introduced himself in week 1 on Sunday Night Football. Mack dazzled a national audience becoming the 1st defensive player in NFL history to record a tackle, a sack, force a fumble, recover a fumble and return an interception for a touchdown in the same game. On one of his 5 hurries forced Rodgers into a sack that knocked him out for much of the game as the Bears forged to a 20-0 lead in front of a shocked and silenced Lambeau Field. His impact on that game far exceeded his 3 tackles, sack, forced fumble and TD on an interception return. Although they lost 23-22 to their NFC North antagonist, the mantle of dominance shifted to Chicago from Green Bay on that day. Mack shifted the entire focus of opponents blocking schemes. The following week against perennial NFC West force Seattle he terrorized Russell Wilson sacking him once, forced a fumble, 5 tackles and another tackle for loss. Yet with all the attention focused on Mack, the Bears integrated 1st round draft pick Roquan Smith into the lineup and the Bears chased Wilson into 6 sacks. A monster defense was born. The affect both of these games had on Sunday night in primetime was immense. Not only did Mack infuse confidence and swagger into his team, opposing teams had to adjust their blocking schemes to accommodate him. Where was he lining up?? We even warned in our week 1 preview: All of a sudden the 2016 Taylor Blitz Times Defensive Player of the Year & NFL Defensive Player of the Year lands in an NFC North without a Pro Bowl Tackle and you don’t think it will be an issue?? 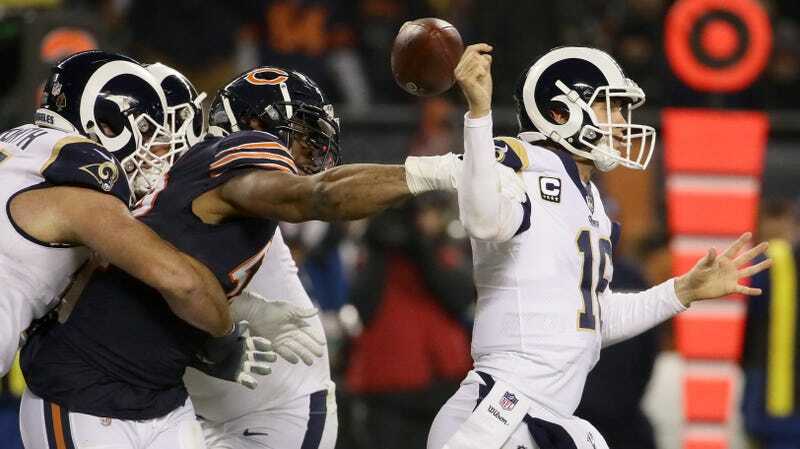 The clincher was another big game where the 9-3 Bears, still battling for respect, hosted the 11-1 Rams and 2017 Taylor Blitz Times Defensive Player of the Year Aaron Donald. Where Donald was neutralized Mack had another 3 tackles, sack and forced fumble as the Rams #2 offense was held to 214 yards and 6 points. By far these were their season lows as the Bears announced they were for real. On two of Jared Goff’s 4 interceptions he was hurried by #52. Mack’s performance has raised the NFL’s 10th ranked defense in 2017 to a ranking of 3rd while garnering 50 sacks. This also ranks 3rd. The Bears won the NFC North for the first time since 2010 and host the defending champion Eagles this weekend. They will do so with a terrorist to come off the corner in Khalil Mack. For good measure the Bears won the NFC North with a 24-17 win over Green Bay in front of a frenzied Soldier Field. Mack had 6 tackles and 2.5 sacks as the Bears eliminated the Packers from the playoffs and soon after fired Coach Mike McCarthy. The changing of the guard was complete. Mack finished with 47 tackles, 10 for loss, 6 forced fumbles, 4 recoveries and an interception for a touchdown. His best performances came against Chicago’s superior competition where Aaron Donald disappeared in games the Rams lost. 2015 – Thomas Davis: Carolina Panthers – The 6th best defense in 2015 & made it to Super Bowl L where Davis played with a plate in his broken arm just 2 weeks after the original injury. Toughness aside he garnered 105 total tackles (75 solo) 5.5 sacks, 4 forced fumbles, 4 interceptions, and 2 fumble recoveries. Although his teammate Luke Kuechly garnered national media attention, the 4 additional sacks and 2 more forced fumble won Davis the Taylor Blitz Times Defensive Player of the Year Award. 2016 – Khalil Mack – Mack’s season has been transcendent as he collected 55 tackles (46 solo) 11 sacks with 5 forced fumbles. He’s recovered 3, returning 1 for a touchdown before we remind you he has 1 pick for another touchdown that also came in the win over Carolina. These are huge impact plays that decide contests not innocuous stats in the middle of a game without meaning or context. In the last 2 seasons he has 14 sacks that have come in the 3rd & 4th quarter of games. 2017 – Aaron Donald – Despite missing 2 games, Donald forced 5 fumbles in his 11.5 sacks and had 15 tackles for loss. Keep in mind he held out all of the preseason awaiting a new contract. Imagine had he been in game shape in week one?? Congratulations to Khalil Mack and his Bears have a big game with Philadelphia tomorrow… will he have another big game performance himself?? The 2017 season has to have the most parody of each NFL division in the NFL. Each team have strengths and weaknesses that are glaring as the season nears. There are some camp battles that won’t be settled for several weeks but we have to get a tentative look at what we expect in the upcoming season. However each team have huge questions that need to be answered. Murrray is 1/2 of a potent backfield. With Andrew Luck entering his 6th season and the prime of his career… Is he the great quarterback some pundits tried to label him as or has he regressed?? Does he have enough talent around him?? Only one team comes in on a high note coming into 2017 and no we’re not talking last year’s division winner in Houston. One of the Chancellor of Football’s measures going into a new season is how a team finishes the season before. Tennessee finished winners in 4 of their last 5 games in 2016 including a 24-17 over Houston in the finale. Keep in mind QB Marcus Mariota had already been injured and missed that game. A closer look and the Titans finished triumphant in 5 of their final 7 games highlighted by a 45-27 thrashing of the Green Bay Packers. DeMarco Murray finished as the 3rd leading rusher with 1,287 yards and if he stumbles, former Heisman winner Derrick Henry (490 yds/5 TDs) can pick up the slack. By the time we look at Mariota running when passing plays breakdown, Coach Mularkey’s team was 3rd in football with 2,187 yards. With a 4.6 yard average and returning 2 Pro Bowl Tackles (Jack Conklin & Taylor Lewan) the running game should be there to keep defenses honest. In Indy, the Colts have a lot on Coach Pagano and Andrew Luck in what could be the head coach’s last season. This team was 1-6 against playoff teams last year and suffered a huge loss with the retirement of DE/LB Robert Mathis. Not only was he a team leader he finished with 2nd on the team with 5 sacks behind Eric Walden (11). The Colts drafted 7 defenders last April yet will that be enough to elevate last year’s 30th ranked defense?? With defenses gearing to stop TY Hilton (91 rec. 1,448 yds 5 TDs), Phillip Dorsett (33 rec. 528 yds 2 TDs) could emerge as a 2nd 1,000 yard receiver. Luck will have to push the football this season and won’t be able to play it safe. His interception totals may go up as pressure mounts to save Pagano’s job. However rebuilding a defense one year after rebuilding an Offensive Line, the Colts are a year away from improving on the field. Watson has to finish camp as the starter. If DeShaun Watson can begin the season as the starter, Houston can make the playoffs. Odds are he wont but circle the calendar on October 8th, a week 5 affair vs Kansas City. A 1-3 start is possible as they host Jacksonville, at Cincinnati, at New England, then return home against the Titans. Coach O’Brien will lean on his defense and hope he has time to develop the prized rookie. Savage will struggle and with the recent success of rookie QBs including Dak Prescott up the road in Dallas, he will be thrust into the action. The other date to circle is Sept 24 week 3 v. Seattle. The Titans will look at this early season inter-conference game against the NFL’s elite and with a win comes newfound confidence. A win in week 4 v Houston and the Titans will put everyone in the AFC South on notice that they’re the heavyweight in the division. Mariota improved in yardage (3,426 v 2,818), touchdowns (26 v 18) and threw 1 less interceptions although he attempted 80 more passes. The only improvement to match Mariota’s in the last two years is Oakland’s Derek Carr. The team he gets a shot at in week 1. This could be the 1st of 2 meetings in 2017. The Tennessee Titans will win the AFC South. How did Taylor Blitz Times fare with predictions in 2016?? When you think of the 2012 NFL season, most football fans thought the Houston Texans were an imposter when asked if they were a legitimate Super Bowl contender. Although they had rushed out to an 11-1 record, they failed to capture the imagination of fans or pundits outside Houston. Sure they had defeated the eventual champion Baltimore Ravens 43-17 in week 7. However mind numbing losses to Green Bay (42-24), and a Monday night massacre in New England (42-14) late in the season, cast doubt on their Super Bowl legitimacy as the playoffs neared. They did finish 12-4 winning a Wild Card game before losing in the AFC Divisional round to the Patriots. Yet the question remains… Who are the Texans?? Are they a team moving up to elite status or are they beneficiary of the AFC as a conference becoming weaker?? Texans QB Matt Schaub will turn 32 this season. Quarterback: Caught in that same identity vortex is quarterback Matt Schaub. Twice in the last four years he has been a Pro Bowl performer yet he leaves you wondering. Coming into last year the team and it’s fans were buoyed with optimism after backup TJ Yates led the team to a Wild Card win the year before. The overall feeling was if they could make it this far without Schaub, they should be able to compete for a title with him being healthy for the playoffs. The fact that they didn’t advance any further raises doubt if they can win it at all with Schaub at quarterback. Make no mistake this team is better with Schaub at the helm but this may be his make or break year with the Colts coming on strong. In 2012 he completed 350 of 544 passes (64.3%) for 4,008 yards 22 TDs with only 12 interceptions. The perception was he didn’t perform when he faced the league’s elite. To that there is some truth but early in the season he carved up the Denver Broncos with 4 TD passes in a 31-25 victory on the road. He had his chance to show the nation when they lost to New England on that December Monday Night 42-14. In that game he looked disengaged, not the leader you’d want at quarterback, and couldn’t make a play to turn the momentum. For most, he sits in that abyss of good quarterbacks that aren’t thought of as championship signal callers. Right where Joe Flacco was last year and where Matt Ryan sits this year. This is Schaub’s make or break year. This will be his 7th season as quarterback of the Texans and 11th overall after coming over from Atlanta. Its ironic that he and Ryan are both in the same position. 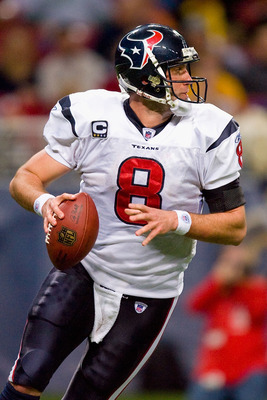 Had Schaub not signed with Houston, he would have taken over the Falcons after Michael Vick’s dog fighting conviction. Yet he’s still a good quarterback that has to prove he can be a championship one. The nucleus of this team is aging and at 32 when the season starts, Schaub will be right there with them. Houston is playoff calibur at quarterback until proven otherwise. Arian Foster has been among the best running backs in football. Offensive Backfield: Going into his 5th season, the Texans couldn’t be more solid at running back with Arian Foster leading the charge. Next to Adrian Peterson, no back in football has been more productive than Foster’s 4,264 yards and 39 TDs over the last three years. He isn’t the flashy runner breaking the huge play like CJ2K or Peterson, but he’s a steady performer that churns out important first down after first down as the Texans closer. This is a running back in the prime of his career and has a solid back in Ben Tate (4.3 yards per carry in 2012) to back him up. The offense runs through the one cut and go running game Foster brings to the table. In 3 of the Texans 4 losses last year, Foster failed to rush for 50 yards. Part of it was Coach Kubiak abandoning the run once they fell behind. The Texans are Super Bowl quality at running back and should get a 1,300 yards from Foster this season. 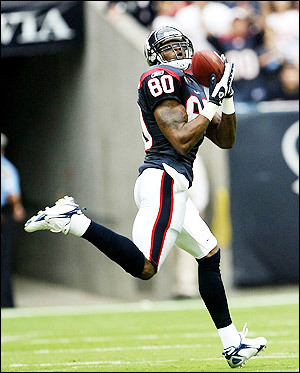 Receivers: A fascinating study is Andre Johnson. When you’re watching him on game film, he doesn’t look as quick as he did a few years back. He seems to only be explosive in spurts now and really gets by on guile.You do realize he’ll also be 32 years of age when the season kicks off. He was the prime target in this offense gathering 112 passes for 1,598 yards, yet only caught 4 touchdowns. What’s missing now is the big play element from the offense with Johnson and TE Owen Daniels (62 rec. 716 yds 6TDs) as the intermediate threats. With 818 receptions for 11,254 yards in his career, Johnson’s numbers are approaching all time great status. It looks as though the Texans realize this and released WR Kevin Walter who was the intermediate receiver across from Johnson. What they need is exactly what they let go in 2011, a Jacoby Jones. Right now this offense is missing a home run hitter that can take the Safeties deep. Houston anointed 2nd year wideout Keshawn Martin to the starting line-up to be the X receiver but he’s unproven. Look for the Texans to add this element in the draft or a free agent signing to compete with Martin. If they can address this they can upgrade their ranking. As it stands they are playoff quality because teams know they can’t get deep and clog the routes 20 yards or under. Offensive Line: In today’s NFL, the offensive line is measured by how well they can protect the passer by most pundits. However here we grade beyond that. This group allowed only 28 sacks last year which was good enough for 7th best in the NFL. Left Tackle Duane Brown was an All Pro while making the Pro Bowl with Center Chris Myers and Guard Wade Smith. However Smith and Myers will each be 32 by the time the season kicks off. They’re young at the tackles but older on the line’s interior. One aspect of the game they could use some improvement is run blocking. How can we say that about a group that had 3 Pro Bowl members and a 1,000 yard rusher?? Very simple. Foster isn’t a back that dances. He takes the ball on “Belly” and “Stretch” plays, makes a cut and then goes up-field. However they are 30th in negative rush plays to the strong side with 20 and 31st to the weak side with 28. Further evidence is when it’s 3rd or 4th and goal or less than 2 yards, this group only converted 57% of the time to the strong side which was 20th in the league. This team could only run up the middle where they did convert 75% of the time in obvious power situations. So it’s obvious they struggle with younger more athletic defenders. This will only get worse over time and lowers their ranking to average. 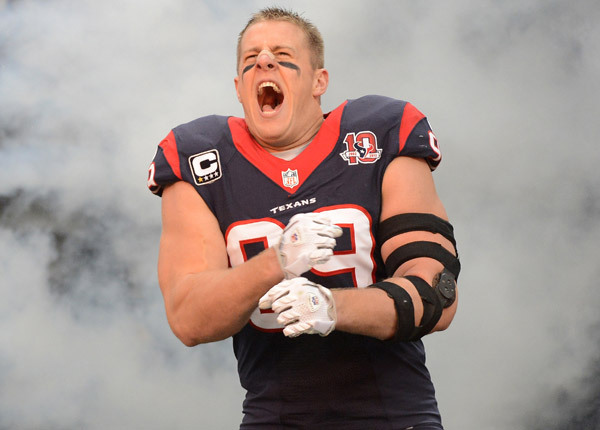 Defensive Line: This group begins and ends with JJ Watt who is the premier defensive lineman in the game. The reigning NFL Defensive Player of the Year had a career season with 81 tackles, 20 1/2 sacks, 4 forced fumbles, and 16 defensed passes. Sixteen?? That is an obscene number. One thing they should do is move him around more so he can’t be game planned out of being effective. That is what New England did and he wasn’t a factor in the playoff game or the 42-14 loss. If Cushing can have a bounce back year….watchout! Will he be inside or outside?? Linebackers: We just mentioned the loss of Connor Barwin who signed with the Philadelphia Eagles. This team can hopefully get a healthy year out of Brian Cushing who could be moved back outside. In fact last year’s infirmary list included Cushing, Darryl Sharpton, Tim Dobbins, and Barrett Ruud missing a combined 27 games last year. This was the Achille’s Heel of the defense but that is understandable when you’re playing second string all year. Bradie James was the leading tackler on this team with 76 stops and had 1/2 a sack. With so many players injured it’s almost impossible to gauge how effective this group will be. 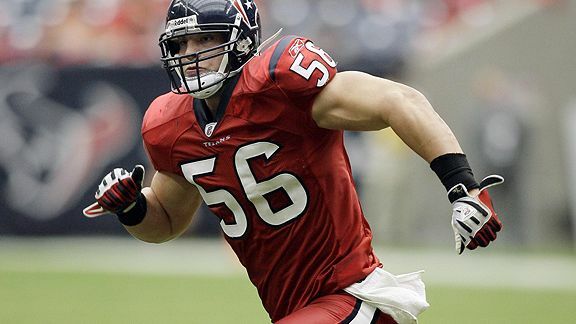 They do have pieces in place and we’ll have to see if they are going to draft an outside linebacker or what we believe… Brian Cushing will go back outside. If they can get their linebackers on the field we think they can be good. However since we haven’t seen them hit the field yet we have to grade them as below average. 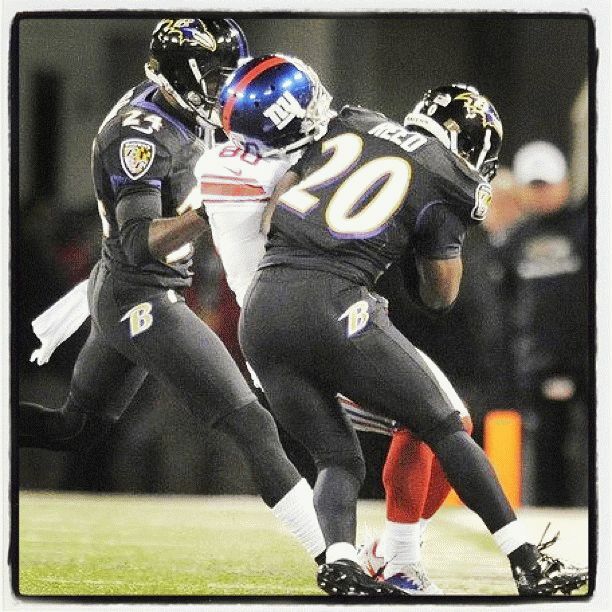 If Ed Reed can hold up this season, he can transform this defense from a good one to a great one. Last year’s Free Safety Glover Quinn was second on the team in tackles with 85 yet intercepted just 2 passes. Now you know why the Texans went after Ed Reed. SS Danieal Manning will come up and make a hit but these guys are limited cover guys. This group is playoff caliber if Reed plays like he did in Baltimore. The Chancellor would like to see more out of this group when it comes to coverage. Could see another draft pick used on corner and safety as well. They need some insurance to keep coverage on slot receivers. With the addition of Reed this is now a playoff caliber group. Overview: This team is on the verge of having to retool on the offensive side of the ball. They are at a collective age where a crash could happen at any time. Schaub, Johnson, and the center of the offensive line all being over 32 years of age?? Tight End Owen Daniel will turn 31 in November. You better believe the time is now for this group. They couldn’t pull past the Colts while Manning was there and now they have to put up with a completely new Colts regime. One that gained confidence beating the Texans in the finale last year 28-16. 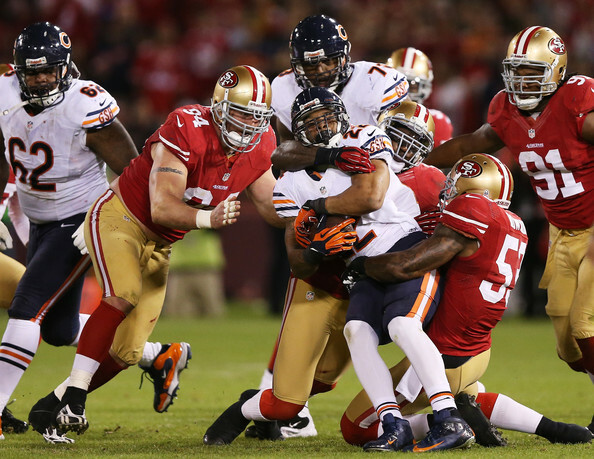 In the thick of the 49er defense you have to appreciate Bowman’s play. When it comes to the heart of the Taylor Blitz Times, we’re all about defense. Nothing is better than the thrill of the hunt and the thump of the pads. We love offense but our soul will always be defense. Last year the Cleveland Brown’s D’Quell Jackson was our first recipient and was the heart of an unsung defense that kept the team in games until the bitter end. This year’s recipient has been one of the best players over a two year period. Navorro Bowman is the 2012 Taylor Blitz Times Defensive Player of the Year! This is a player that is never out of position. Sure the media and pundits flock to Patrick Willis but there were times where they mistook Willis tackle for one Bowman made. With the numbers 52 & 53 so close you have to double take but understand this fact Bowman has led the 49ers in tackles each of the last two seasons. In 2011 he was an All Pro with a 150 tackle, 2 sack performance with 8 passes defensed. Somehow he didn’t make the Pro Bowl. In 2012, he repeated that type of performance with 144 tackles, 2 sacks, 6 passes defensed, and 1 interception with a fumble forced. 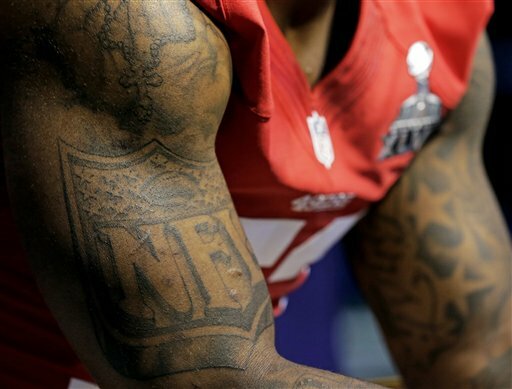 He was everywhere and here we are with the 49ers in the Super Bowl. Who was it that knocked down the pass for Atlanta Falcon receiver Roddy White on 4th down?? Bowman didn’t panic and with his off-hand knocked down the pass and didn’t panic and interfere at the 5 yard line. He’s the best linebacker in the game right now and his motor doesn’t go off. The difference in our picking him over JJ Watt was in games of importance how well did you play? Could you make plays when your team desperately needed you to?? Watt tended to disappear in games where Bowman never did. Take the 42-13 loss to the Seattle Seahawks. The 49ers were out of that game early 28-6 at the half, and he was after it like the game was tied. Of his 15 tackles, 14 came against the run and he was the leading tackler documenting stops on 7 quadrants across the field. Whether it was a run to the middle, around right or left end, he was there to put to put some thump on Marshawn Lynch and Russell Wilson at the end of the run. Fellow All Pro Willis only had 6. He led the team when the ball was run over LT, LG, C, RG, RT, and led in tackles around the left end and the right end. He was everywhere that night. He’s been everywhere in these last two years and in 2012, the Taylor Blitz Times Defensive Player of the Year. Another player that was everywhere was Daryl Washington. 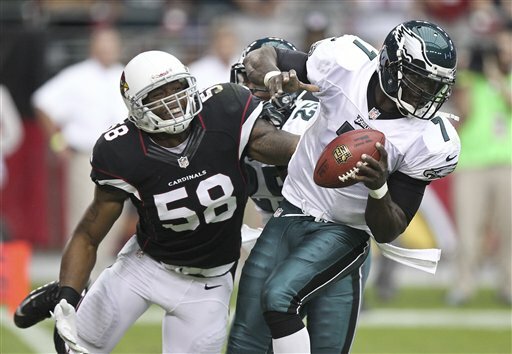 Daryl Washington ILB – Arizona Cardinals: This guy played strong all season and didn’t get the recognition because of the Cardinals poor record. He was the most active player next to Bowman all season. Most of the times you have a player that has high sack numbers and poor tackle numbers. He had 134 tackles, 9.5 sacks and an interception while forcing 2 fumbles. He was the reason they started 4-0. He made splash plays all over the field. Arizona was a top 10 defense most of the year and finished 12th overall. Watch for him next year. A wrecking ball of a player and our #2 choice. 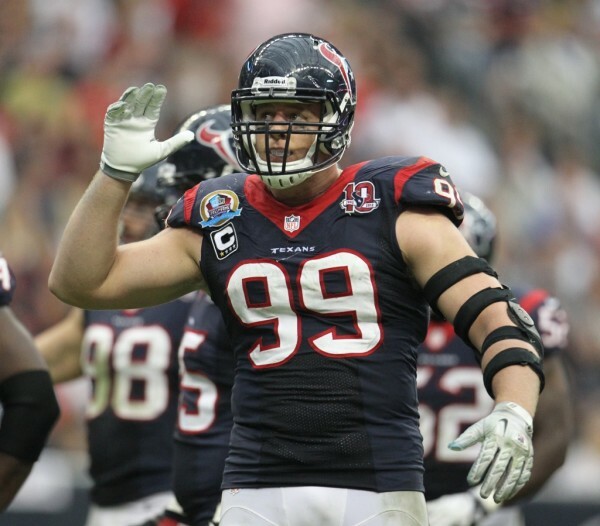 JJ Watt DE – Houston Texans: This year was the best DE in the NFL without question. He led his team in tackles (81) and led the league in sacks with 20.5. His 16 passes defensed helped a defense that had many injuries this season. However in big games against the Patriots in both the regular season and playoff loss, we couldn’t find him. One of those team leading 4 forced fumbles needed to come during that slide where the team lost 3 of 4 trying to secure home field throughout. He has to be able to break through when teams gameplan against him. He had an exceptional year and is the third player in our count.